10 million U.S. homes either cut the cord or skipped over pay-TV distributors since 2010, when the share of households with traditional video service peaked. More than 1 million consumers canceled their cable-TV or satellite subscriptions in the past quarter, one of the largest seasonal drops ever. Online video-streaming services with a more limited range of channels, known as skinny bundleshave been growing, but not fast enough to offset the decline in traditional subscribers. More than 1 million consumers canceled their cable-TV or satellite subscriptions in the past quarter, one of the largest seasonal drops ever, stepping up pressure on pay-TV providers to generate revenue in other ways. Old-guard companies have turned to streaming services and partnerships with digital video startups to stanch the loss of pay-TV subscribers and convert some into different kinds of customers. Yet figures reviewed by The Wall Street Journal show that those tactics have failed to offset the erosion of what used to be one of the entertainment industry’s most profitable businesses. Fiber-optic broadband services like Verizon Communications Inc.’s VZ -0.88% Fios and AT&T Inc.’s U-verse have shed pay-TV customers most quickly in recent years, though they had a smaller subscriber base from the start. Satellite operators—AT&T’s DirecTV and Dish Network Corp. DISH -1.92% —have lost the most customers overall. Rich Greenfield, media and tech analyst at brokerage firm BTIG, said satellite firms were more vulnerable to subscriber losses than companies that sell cable TV and broadband access because demand for internet connections remains healthy. Many residents who sign up for cable broadband get TV as part of the bundle. The pay-TV decline comes as many U.S. households are turning to the internet for entertainment and canceling their traditional subscriptions, a phenomenon called cord-cutting. 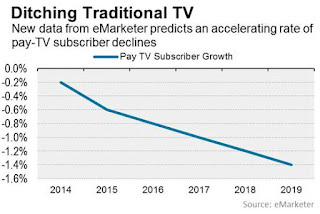 A growing share of Americans, known as cord-nevers, are forgoing pay-TV altogether. Research firm MoffettNathanson LLC estimates more than 10 million U.S. homes have either cut the cord or skipped over pay-TV distributors since 2010, when the share of households with traditional video service peaked. DirecTV and Dish have countered by launching their own online video-streaming services with a more limited range of channels, known as skinny bundles. DirecTV Now and Sling TV have been growing, but not fast enough to offset the decline in traditional subscribers. Most cable companies are reluctant to invest in their own skinny online bundles—also known as over-the-top packages—because they lack a nationwide customer base. But they are embracing on-demand video providers they once considered a threat. Comcast Corp. CMCSA -0.32% , for instance, is offering its customers access to Netflix , NFLX -1.26% YouTube and Sling TV International through its X1 set-top box. The company also recently announced it would offer customers the ability to add Amazon Prime to that system. Many players outside the cable-TV industry have launched their own skinny bundles, including Sony Corp.’s SNE -1.64% PlayStation Vue, Alphabet Inc.’s YouTube TV and FuboTV, a sports-focused startup. Those services are growing quickly. But skinny bundles aren’t as lucrative for providers. Deutsche Bank analyst Matthew Niknam estimates skinny bundles’ profit margins are a negative 6%, versus a positive 38% for traditional pay-TV packages. 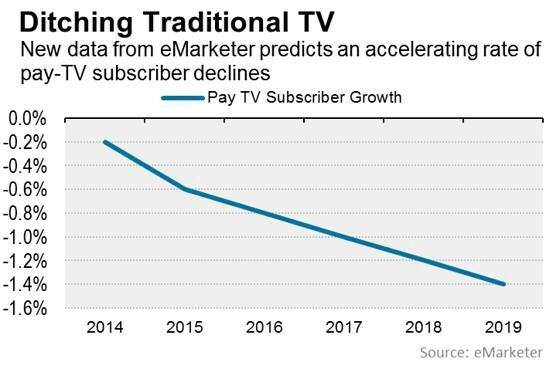 And even in absolute subscriber numbers, streaming TV’s growth isn’t enough to offset the decline for traditional pay TV.